(1965) "King of the Road"
"King of the Road" is a song written and originally recorded in November 1964 by country singer Roger Miller. The lyrics tell of the day-to-day life of a vagabond hobo who, despite being poor (a "man of means by no means"), revels in his freedom, describing himself humorously as the "king of the road". It was Miller's fifth single for Smash Records. 3.1 "Queen of the House"
The popular crossover record hit No. 1 on the US Country chart, No. 4 on the Billboard Hot 100, and No. 1 on the Easy Listening surveys. It was also No. 1 in the UK Singles Chart, and in Norway. Miller recalled that the song was inspired when he was driving and saw a sign on the side of a barn that read, "Trailers for sale or rent". This would become the opening line of the song. The song has been covered by many other artists, including George Jones, Dean Martin, Val Doonican, Jack Jones, James Booker, The Fabulous Echoes, Boney M., R.E.M., Johnny Paycheck, Glen Campbell, Alvin and the Chipmunks, Boxcar Willie, Randy Travis, Rangers, James Kilbane, John Stevens, the Statler Brothers, Rufus Wainwright & Teddy Thompson, Giant Sand, Peligro, The Proclaimers, Ray Conniff Singers, The Reverend Horton Heat, Jerry Lee Lewis, and Jim White. James "The King" Brown (an Elvis impersonator) performed the song for a 2001 Audi commercial on German TV. Of R.E.M. 's version, a shambolic, drunken, offhand rendering, guitarist Peter Buck would later comment, "If there was any justice in the world, Roger Miller should be able to sue for what we did to this song." The song was performed live by Merle Haggard, Willie Nelson, Marty Stuart, Dwight Yoakam and Dolly Parton during Miller's posthumous induction into the Country Music Hall of Fame at the 1995 CMA Awards ceremony. The song is featured in Wim Wenders' 1976 film Im Lauf der Zeit (In the Course of Time; English title Kings of the Road). It is also played at the beginning of Talladega Nights: The Ballad of Ricky Bobby, Brokeback Mountain, Into the Wild (2007), Traveller (1997), and Swingers (1996). Miller performs it in the concert film The Big T.N.T. Show. The recording by The Proclaimers is included in the film The Crossing (1990). Near the end of their official music video, the pair are shown reading a newspaper whose headline is "Roger Miller, King of Plugs". The song appears in an episode of the Super Dave TV show, where Super Dave Osborne (Bob Einstein) sings along to Miller's recording of the song, while sitting at a piano mounted on top of his tour bus. The bus eventually goes into a low tunnel, slamming into the piano and Osborne and pushing them off the bus and onto the ground. A send-up version by English entertainer Billy Howard was a British chart hit in 1976. A German version by the band Wise Guys exists, the parody referring to speeding on the Autobahn. 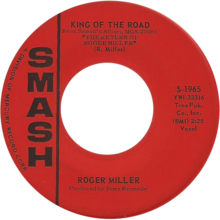 Country music singer Jody Miller (no relation) answered "King of the Road" with "Queen of the House" (1965). The song used Roger Miller's music while changing the lyrics to describe the day-to-day life of a stay-at-home mom. The words were written by Mary Taylor. Singer Connie Francis later recorded the song on her 1966 album Live at the Sahara (1966). The Supremes performed the song in their nightclub act. It can be heard on their The Supremes at the Copa (1965) album and I Hear A Symphony remastered CD, which includes their September 1966 appearance at the Roostertail in Detroit, on the second disc..
^ a b c d Rice, Jo (1982). The Guinness Book of 500 Number One Hits (1st ed.). Enfield, Middlesex: Guinness Superlatives Ltd. p. 92. ISBN 0-85112-250-7. ^ Mike Callahan; David Edwards; Patrice Eyries; Randy Watts. "Smash Records Story". www.bsnpubs.com. Retrieved December 20, 2009. ^ Whitburn, Joel (2004). The Billboard Book Of Top 40 Country Hits: 1944–2006, Second edition. Record Research. p. 231. ^ Whitburn, Joel (2002). Top Adult Contemporary: 1961–2001. Record Research. p. 171. ^ "King of the road : der Hit aus der Audi Werbung" (in German). German National Library. Retrieved July 17, 2014. ^ Wethington, Kari (January 24, 2009). "Cowboy Junkies". Elle. ^ "45cat". Retrieved June 8, 2016. ^ "wise guys" (in German). Retrieved June 8, 2016. ^ a b Roberts, David (2006). British Hit Singles & Albums (19th ed.). London: Guinness World Records Limited. p. 440. ISBN 1-904994-10-5. ^ "Top RPM Country Tracks: Issue 3235." RPM. Library and Archives Canada. June 16, 1997. Retrieved July 17, 2013. ^ "MusicMatch guide, "Jody Miller"". Mmguide.musicmatch.com. Retrieved April 5, 2014. ^ "Digital Tradition Mirror, "Queen of the House"". Sniff.numachi.com. Retrieved April 5, 2014. This page was last edited on 30 March 2019, at 22:51 (UTC).